#Mesa, #Chandler, #Gilbert and the entire #Phoenix metro area of #Arizona, come on down to #Tempe Arizona and join Veterans and Their Pets at Eagle Rider Motorcycle Sales . All proceeds from this event will benefit Veterans and Their Pets(SM) geared towards fun for the entire family, including your Bow-wows! 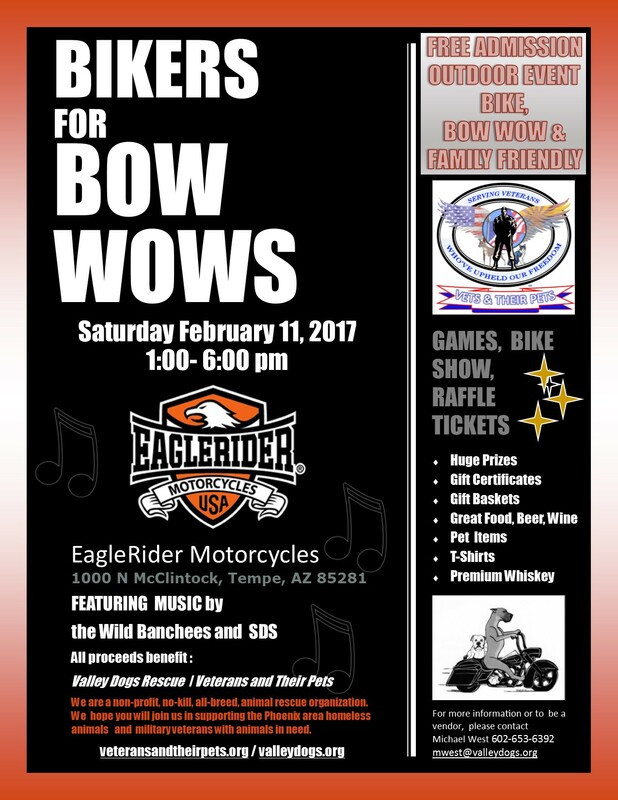 Eaglerider Arizona is hosting this event on February 11, 2017, from 1-6pm, and is located at 1000 N. McClintock Dr., Tempe Arizona 85281. Food, Drinks, Music, Raffle, Games and more for the entire family. This entry was posted in Helping Others, Military, puppies, Uncategorized, Veteran, Vets and Their Pets and tagged dogs, EagleriderAZ, vetsandtheirpets. Bookmark the permalink.